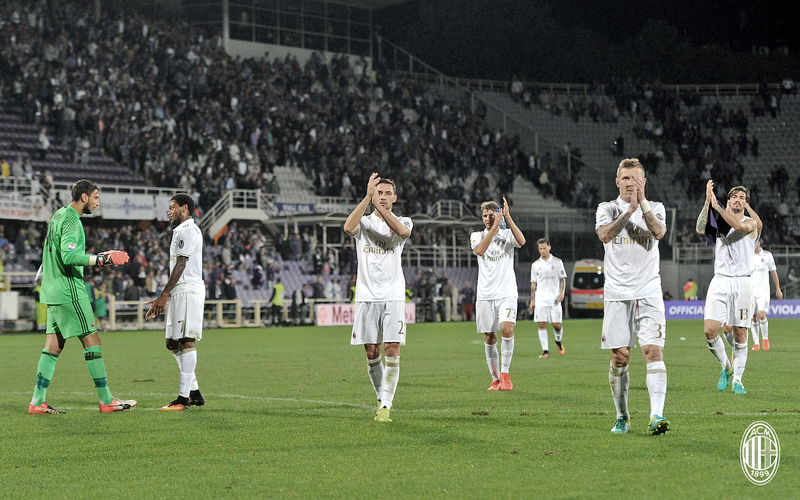 I wrote in the preview that this match was dependent upon how Fiorentina showed up. And then they actually did show up. Dominating in both possession and play, 20 shots on goal with five on target, we were lucky to escape with a point. 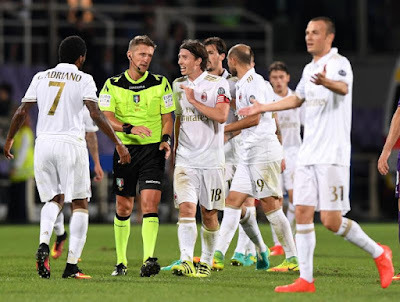 There was also ref controversy, with both teams leaving the pitch thinking “what if?” But Milan weren’t able to do more than stave off a hungry Fiorentina. And so for all of those reasons, I would say that Milan were fortunate. The first fortunate event for Milan was in the 16th, when Paletta tried to take Kalinic as his wife inside the box, and Orsato invoked the don’t ask, don’t tell policy (or more likely just didn’t see it.) Whichever was the case, it was a clear penalty, unlike later controversies. Milan were very lucky to escape that one. 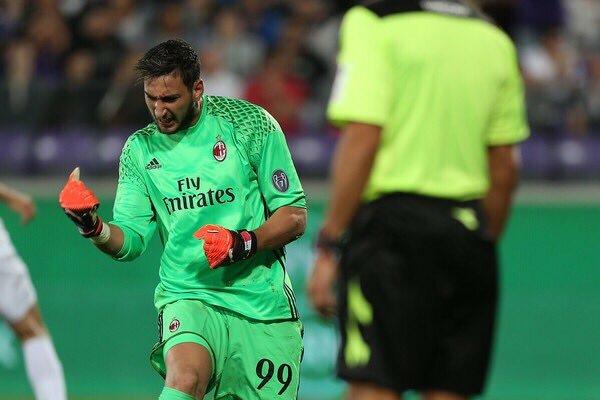 Then, the cost of our commitment to youth showed when Calabria gave up a penalty in the 22nd. Ilicic went to the spot to take it, with a perfect penalty record last season of seven out of seven. But he hit the post this time, and Milan were more than fortunate there. The final controversy occurred in stoppage time. Adriano was clearly fouled and taken down, but no call. A lot of people thought it happened inside the box, but replays show that the contact was initially made outside the box, so it would have only been a free kick anyway. It may seem that Milan were unfortunate here, but when you look at the other events, we were actually fortunate over all. There was a lot of anticipation about how Montolivo would be received at the club he stabbed in the back to come to Milan and usurp our captaincy. And Fiorentina fans did not disappoint. They still hate him. Montolivo is inconsistent as a player, but the one thing he consistently does well is to piss off his own fans. I will say this, though: he did a few things well last night. Actually his best game of the season, barring the yellow card at the end of the first half and most of the rest of the match and the incessant whining to the ref . In fact, he was already appealing to Orsato before the whistle blew at the beginning of the game. Probably because of the whistling the Fiorentina fans were already showering him with or something. In the end, our measly twelve shots with only one goal cost us, as well as our 38% possession. However, our players looked more confident, and their passing has definitely improved. So that’s something. We were able to hold back a fiery Fiorentina. And keep third consecutive clean sheet, too. And while they are not the best team we will face this season, it was a great test for us. Maybe we missed a chance for another three points, but I felt like we were lucky to escape with one point. Not our best game ever, but certainly not our worst, either. So all in all, we were fortunate.